The other day, my news feed was full of that story. You know which one. The story about the black girl who was brutally dragged from desk in a high school classroom by a white uniformed police officer after refusing to get off her cell phone and leave the classroom. I'd seen the story the previous afternoon, but I didn't want to play the clip; I knew what I'd see, and I didn't want to watch another black girl's body be treated like it wasn't even human. Part of me wondered if I had a responsibility to watch, to bear witness, to know that my privilege makes this inhumanity possible. And then part of me thought about how I would feel if that had been my daughter, knowing that it would likely never have been my daughter (because she is white), and it made my stomach churn. I finally ended up watching it, but not until I'd thought a lot about my role as a viewer. I've written before about my mixed feelings towards hashtag activism: how it can become a throwaway, even with the best intentions. And now, I realize there's something else that troubles me about the way in which we produce and consume activism on social media: it can be awfully voyeuristic. Social media is a powerful tool for activism. But if all we do is watch, and share, it can become a twisted form of entertainment, like rubbernecking at a car wreck. Important images that bear witness to injustice can be diminished without deep thought, and context, and action. An article in the New Yorker last week offered some interesting (though perhaps hardly surprising) data about bullying and bystanding online: that not only is bullying harder to escape in virtual spaces (because you can't physically walk away), but that bystanders act less often in defense of the bullied, for a variety of reasons, including: the victim is dehumanized by our computer screens, adults imagine that their comments as justified outrage instead of the kind of harassment they imagine perpetrated by children. I wonder if similar principles are at work when we share images of people being bullied. How does that complicate our role in the act? When oppressed people watch or participate in destructive behavior toward one another in the name of social justice, in some way our values, and perhaps our pain, feel reaffirmed. We want to believe we are doing something powerful by adding our voices to already fraught conversations, and in fact we are; but at times it less the reestablishment of justice and more the reactivation of oppressive power dynamics. Author Frank Castro explains that upvoting, doxxing, etc. -- the kinds of things we do as participant hashtag activists -- is, in the end, counterproductive to the cause. I think something similar happens in the consumption of images and videos produced in support of social (in this case racial) justice. And I don't think it's race-neutral. Because aside from the fact that this never would have happened to a white girl, I don't think we would have filmed a white girl being treated this way, and I don't think it would have gone viral even if we had. Black bodies are objects of consumption in a way that white bodies aren't. Like siding with infighting activists, this becomes a spectator sport, reactivating the power dynamics that create the situation in the first place. We have the privilege of viewing, knowing that many of us are safe behind computer screens. I don't think that we should stop sharing disturbing stories. We need those stories to be told. But I do think that we should be more thoughtful about how we share media, understanding that what we're seeing isn't just a movie, that consuming media gives us power, and that we should wield that power carefully, in the service of justice. When I was growing up, we all carved pumpkins. If you had a pumpkin for Halloween, that's what you did with it. You didn't paint it, you didn't cover it in glitter, you didn't stick Mr. Potato Head parts on it, you didn't do some crazy Martha Stewart Pinterest thing to it. There were no special carving tools. You got out your kitchen knife, and you went for the jugular. Probably you had some adult on hand to help. But you certainly stuck your hands into the guts and pulled out the stringy seeds; even the littlest of children could do that. I admire the intricately carved pumpkins you see more of now: people have made it into an art form. An email came to my inbox yesterday with a host of things you could do to your pumpkin to avoid carving it, avoid the mess, avoid the seeds. And I wondered, for the fifty billionth time, whether we're overprotecting ourselves. So I did a little research. I'd still like to believe we can do things the old-fashioned way. I still think that we ought to make our kids de-gut the gourds. It's like a rite of passage. But maybe it's safer not to give them a knife, but to give them the can opener to open the pumpkin puree for making muffins. To carve or not to carve? Tell us below. Heat oven to 350 degrees. Put liners in 12 standard-sized muffin cups. Whisk together flour, baking powder, baking soda, salt and spice in medium bowl. In a larger bowl, whisk together pumpkin, oil, eggs and sugar. Add dry ingredients to wet and stir until just combined. Divide batter among muffin cups (each about 3/4 full). Bake until puffed and golden brown and wooden pick or skewer inserted into the center of a muffin comes out clean, 25 to 30 minutes. Cool in pan on a rack five minutes, then remove from pan and cool completely. Not sure what #MicroblogMondays is?Read the inaugural post which explains the idea and how you can participate too. I'm tired of the barbs I see thrown from either side. And today, I wanted to write to say thank you for being who and where you are. I wanted to say thank you for helping to run the PTO whose meetings I can never attend, but whose fundraisers I consistently support. I wanted to say thank you for volunteering to be the class mom and organizing the parties to which I can send fruit platters, and from which my children bring home crafts and holiday themed pencils that they cherish. I wanted to thank you for volunteering in the library, for organizing the Scholastic Book Fair and making sure there's a family night I can attend, for chaperoning school trips that I can't. I wanted to say thank you for helping to get my daughter to dance class because I would never be able to pick her up from school before aftercare is over, so she'd never get to dance, which is her heart's desire, and part of what she loves best about dance class is attending it with friends like your daughter. I wanted to say thank you for picking her up from school on the days when I know I can't get to aftercare on time, because she is learning that is takes a village to raise a child, and that she can trust lots of adults, not just me. I wanted to say thank you for being a role model for children who can choose to become stay at home parents some day, if their finances permit, just as I am a role model for your daughter, who may choose to work outside the home. Maybe there are times I envy you, but I also know myself well enough to know that I am where I need to be, and you are where you need to be, and maybe it would be helpful if every once in a while we were just grateful instead. I don't think it happened to me until I started baking cupcakes. But maybe I never did anything serially until I started baking cupcakes? No, now that I think about it, it happened before then, too: with the web. I was always the person people asked, because I was often the youngest in the room, and so people assumed that I had some superior aptitude (and interest) in technology. The web was in its infancy, and I'd been there in my dorm room to see it sprout out of Gopher. Which made me an authority. While I've always appreciated technology, for me, web design was more about an outlet for an interest in art, my lost sketchbooks, things that I dabbled in throughout elementary school. And a love of fonts, if truth be told. I loved how different looking words made me feel different about the words. For someone who loves words and appreciates art, font design is like Nirvana. So I built web pages. The first when I was an intern in the academic services office in college; they liked the masthead so much that they made it in miniature on post-its that they distributed liberally to all incoming students. And then another in grad school, in the grad office where they needed some help making fellowships more accessible. And somewhere in there I had a short part-time stint in a web design company that I named, but had little interest in actually building. I'm not ashamed to admit that I'm not actually very good at building web pages. I'm better than your average technology-averse person, I guess. I understand how to organize information; that's less about technology than it is about my obsessive type-A personality that likes everything organized. I know how to appreciate good design, but I'm not motivated to learn programming languages. I like the ease of drag-and-drop, as if I'm drawing or painting or making collages. But somehow now it's a thing, especially at work: Justine builds web pages. I resent the throwaway nature of web-page-building-assignments; in my case, where people don't spend much time on the pages, it's busywork. A necessary evil. No one is making important decisions about web pages. And even I know that people don't really browse the web like they used to. I know that all of the important information is in more ephemeral media, or more complexly designed sites that no longer feel two dimensional. But even if the work felt more important, I hate feeling typecast about something that I don't even really want to be known for doing, or at least, known only for doing. For a while, I was (maybe in some circles still am) also typecast as a cupcake-maker. I was baking cupcakes regularly for friends and colleagues who appreciated them, partly for my own entertainment, and partly as a shameless attempt to win their love (that totally works, BTW). But then came my second child, and less time, and long months of no job and no colleagues to bake for. I could have started a cupcake business, but I didn't want to be only known for that, either, really. I don't like being single dimensional. And I couldn't claim expertise anyway; it was never like I was inventing recipes all by myself, so I could never really take full credit for development, just for execution. After I got my new job, I baked for a while for students, but that labor of love quickly lost its lustre when I realized they were too busy and too overfed to appreciate them. And--it seems to me, at least--I lost my touch. The same thing happens in blogging, right? At some point, perhaps your brand doesn't fit you as well as it used to. But somehow, you feel sort of like you should be producing the same thing you always have, because you know that your readers come back for it. You write the same thing, in the same way, because it's too hard to recreate yourself. You typecast yourself. Maybe you start to feel a little single-dimensional. The real problem with being typecast is that (aside from the annoyance of feeling like you've been reduced to one dimension) you start to wonder what you're really good at, outside of what people tell you you're good at. Your internal compass becomes corrupted, and it's hard to recalibrate. You do nothing, perhaps, wondering if you should explore some long-lost talent (you used to be good at the piano, didn't you?) or take up something new (Swahili during the commute, perhaps?). You spin, disoriented, wondering where you started, and whether it's still possible to find your way back, or if that's even what you'd want to do, anyway. Have you ever been typecast? Was it or is it for something you enjoyed? Did you embrace the label or reject it? How did it make you feel? Shepherd's pie is usually made with white potatoes, and usually involves ground lamb. The original for this recipe originally had sausage, but I decided on beef and beans because we're having sausage later this week in soup. And the apples and chard and nutty crunch are a welcome change from what you expect. Boil sweet potatoes until soft all the way through. Drain and return to pot. Add butter, splash of milk, and salt and pepper to taste. Feel free to add more or less milk depending on how you like it, or use olive oil instead of butter if you prefer the nutty taste. Beat until smooth then keep lid on to retain warmth. Brown beef in a large skillet. When cooked through remove, reserving dripping in pan. Mix black beans in with the beef. Add diced apples and onions to the sausage drippings. Cook until softened and onions are translucent. Add sage and stir until fragrant. Remove and set aside. Cook down Swiss chard in skillet (about 2-3 minutes). In your pan of choice (I used a 9x13") layer meat and beans, apples and onions, Swiss chard then mashed sweet potatoes. Top with toasted walnuts. My son has always been a little weird about birthdays. Some years he hasn't wanted anyone at all to attend. Some years he wants just grownups. Some years he's wanted just to take one friend, a little girl he's known since he was a toddler, to high tea. Twice, we've had a real party: once here, when I made an attempt at creating a space themed party (complete with moon rocks and jet packs), and once at a paint-your-own-pottery place, which ended up being sort of anticlimactic ("is that all?" asked one very sweet little girl when I served up the cupcakes, party coming to an end). This year, I probably nudged him towards a real event. We don't have a house that's very conducive to parties, though. No basement, a large attic that's his room (but where you can't stand up except in the middle), small living room. And in September and October, there's no guarantee that you can do anything outside; as it was, the weekend had been threatened by the possibility of Hurricane Joaquin before it turned away from the east coast, widely skirting the midAtlantic states. I offered up a movie, but when we started to look at the options, there was nothing much playing, and it feels weird (to me, anyway) to invite people to a movie party where you can't talk with each other. Pottery was out. Laser tag felt awkward with a group of five or six kids. Most places wanted a guarantee of ten children, and they'd charge you whether you brought those children or not. On a whim, I suggested bowling, and he seemed to warm to the idea. There is exactly one bowling alley in our county. (There are actually no movie theaters in the county, so I guess one bowling alley is progress, but don't get me started.) 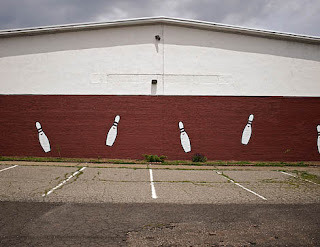 It's an old family-owned place, the sort of place you might drive by and not think twice about, surrounded by dried-up overgrown weeds, adorned with large bowling pins in well-worn paint on the side of the red brick exterior. The almost-always-deserted parking lot is riddled with cracks where weeds push up through the macadam, as if re-staking their claim on the field that used to dominate the plot of land. I'd never been inside. I sent them an email, not wanting to drive an hour to the next-closest lanes, and asked about reserving a time. They took my information casually, making me wonder if they were keeping any record of my request, not asking for any deposit or credit card information. All they wanted was a head count, the day before. It was cheap, as kids' parties go. It seemed almost too easy. My son wanted pumpkin cupcakes. Not vanilla or chocolate, or even red velvet, but pumpkin. I scoured my cookbooks to find something suitable, worried about kids not liking pumpkin, worried about the high standards adults set for my baking, because I hadn't made cupcakes in a while. (This is for another post, but has anyone ever typecast you as something you no longer want to be solely identified for?) In my zealousness, I overfilled the cups with batter, which overflowed into giant cupcakes, stuck together and stuck to the pan. I decided not to pipe, but frosted with a flat knife as liberally as I could, uncharacteristically (for me) to the edges of the cake, knowing that frosting hides all sorts of flaws. Not that most (any?) nine year olds would care about how a cupcake looks. On the day of the party we packed up what little we had to bring with us and drove out, parking, for the first time in my memory, on the cracked macadam lot. Inside the bowling alley, it smelled like sweaty old leather and snack bars of fried food; the plastic orange bucket chairs and dingy plastic-encased computer screens looked like something out of the 70s. My husband kept laughing at the kids who would touch the screens, thinking that something would happen. It was ... retro. And not on purpose. But it was also bright, and friendly, and non-threatening. 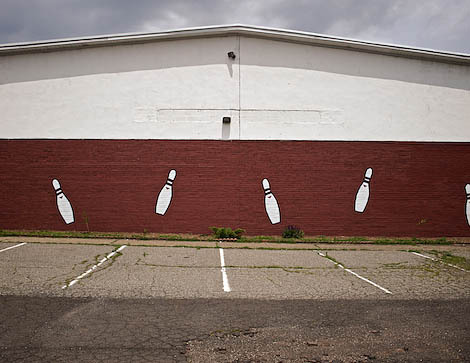 It was a place where kids could wander around back and forth, where you could bowl a terrible game with friends and still have a good time. Which is exactly what we did for the next two hours, adults and kids alike. The kids organized themselves once they had a bowling order, and we asked for an additional lane next to the kids, where we laughed and joked about needing bumpers, cheering wildly when one of us bowled a good frame. And though they weren't exactly everyone's favorite, the cupcakes, like the bowling alley, were just right once you got past appearances. Moist, not too sweet, tasting like fall. Preheat oven to 350 degrees and line your cupcake pan. In a large bowl (I use an electric mixter), cream together butter and sugars until fluffy (about 3-5 minutes). Add the eggs one at a time, beating well after each addition. In a separate bowl, sift together the flour, the baking powder, the baking soda, the ground cinnamon, nutmeg, ginger, cloves and salt. Add a third of the dry ingredients to the butter mixture, mix gently. Add half of the milk. Continue to mix gently, alternating dry ingredients and milk until everything is combined. Don't overmix! Add the pumpkin puree and the vanilla extract and beat until smooth. Fill the cupcake liners 1/2 full (seriously, don't do what I did), and bake for 20-25 minutes or until a toothpick inserted into the center comes out clean. Using an electric mixer, cream together cream cheese and butter until smooth. Slowly sift the confectioners’ sugar into the mixture, and continue beating until all lumps are gone. Add the vanilla and mix until fully incorporated. Add a splash of milk if you would like the mixture to be a little fluffier, and add more sugar if you'd like it to be stiffer; beat to the desired texture. The day began with broken glass. A simple accident: she carried the jar too lightly, and it slipped from her grasp, shattering and scattering across the wooden floor where she stood, barefoot, her small tender feet now framed in diamonds. I lifted her out, set her on the stairs, and as calmly as I could, asked her to go get dressed. "Don't be mad, mama," she sobbed, clinging to the railing as she backed away up to the second floor. I wasn't, not really. I wished I hadn't been trying to get out the door on time for work, maybe. But I wasn't mad. I swept the glass into a dustpan, appreciating the high, thin tinkling sound it made, and emptied it into the trash. She descended again, still sniffling, and pointed out two shards of glass I'd missed. She's like that: observant. I hugged her, picking up the bits of glass in my fingertips, and ushered her to the door. Now, hours later, holding her hand as we waited for the doctor, I wished for the broken glass, the ease of sweeping and disposal. She'd been playing, tripped on a playground stone, struck her chin on a stair, gouging a long deep wound in her chin that seemed to stop bleeding, but split open stubbornly in the middle, showing me parts of her I'd rather not see. I told her to squeeze my hand, joked about having to pee (I did, really), made small talk about Halloween, and told her how brave she was. It had been a week of helplessness. On my walk home from a meeting at the library, I'd heard sobbing through an open window. Listening felt voyeuristic, but knocking felt intrusive. I knew the woman who lived there only a little, didn't know if she was the one sobbing, didn't know what I'd offer if she opened the door anyway. I turned up the street and resumed my pace, heart hard in my throat. And today I'd gotten the phone call about a passing, a mother of twins, separated from a husband who felt no responsibility for his nine year old children, seemed angry to be saddled with the burden of caring for them, had already not-cared for them, continued to not-care for them, neglecting their laundry and hair and grief. They clung to each other. I offered them nothing, wishing I could take them in, knowing I couldn't give them what they'd need, which would just be presence. So much shattered. A friend awaiting trial. A friend assaulted, coping with debilitating illness. Cancer. And on. And on. I tried to concentrate on the small face under the tissue paper, not the sutures that were being carefully, but oh, SO slowly tied. Four, five six, seven. She was crying now, the fear finally showing. I squeezed her hand and told her I was there and said she was brave, because she was. Maybe it wouldn't be right to sweep away the debris. Maybe sutures are the best we can do, the interventions that leave scars and stories, but brave storytellers, too. I just wish they didn't hurt so much to watch.